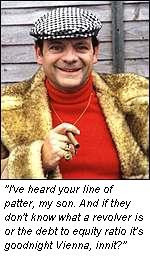 When it came to seduction, Del Boy swore by Yugoslav Riesling and pork-scratchings. IBA’s financial equivalent (paper and charm) may yet win the day. Whilst impressed IBA CEO Mr. Cohen has successfully placed so much equity (conditionally) to finance the takeover (albeit at a steep discount) it is not obvious why iSoft are not able to refinance themselves on similar terms. Yes, confidence in the firm is low but its recovery in operations is undeniable; and it is not as though IBA are bringing a gilt-edged operational reputation or remarkable financial muscle to the table. Then there is CSC, playing the protective-father-of-the-wooed role. IBA, as has been its wont for months, have simply made media and stock exchange announcements unilaterally. CSC can sink this deal (as they appear to have done those of a few other suitors already) given the change of control clause it enjoys with the lass iSoft. Are IBA trying to apply pressure on them to accept the dowry as is? Or, as Mr. Cohen says, is it merely that the lining up of the funding forced the pronouncements? The IBA offer is effectively worth 54.7p per iSoft share (not the unadjusted for dilution 58.1p). But that was when IBA shares were sitting at A$1.255. They have risen over 10% overnight from A$1.21 to A$1.335 on the back of some sharp roadshow marketing by Mr. Cohen in the Australian media. Little prevarication, then, Down Under about a possible iSoft carve-up mitigating the attractions of the betrothed. Meanwhile, back in London, the market in iSoft shares (55p mid) appears confused by the politics of it all. Will CSC block it (there is something bothering them)? Is there more value in the hook up than hitherto thought (probably)? And is another bid coming (doubtful, CSC put most of them off)? Arbing the actual vs the offer price in these competing tides of equity traffic (at least on above board information) looks tricky. In talking up iSoft’s market in the UK & Eire, Germany, the Netherlands and even the tiny but interesting Spain ops, Mr. Cohen has been downplaying the notion of domestic violence in the new matrimonial home (ie asset sales). Yet the new group's financials suggest that married bliss requires plenty of skill (in timing, execution and working capital management) to carry through to completion the iSoft operational recovery plan. It may be that the reason that the market is underwhelemd (£0.53 18/05/07) by the charms of IBA is a case of follow the cash. That history could be repeating itself...? The Daily Telegraph helpfully reported (17/05/07) that "...the results show very poor conversion of profits into cash..." and they quote one Paul Moreland of Arbuthnot Securities..."Recognising revenue but not raising the invoices, it's not necessarily wrong, but it can be taken as a warning signal because cash does not follow revenues." Too right, there is no way it can! It also leads one to question the quality of these results. My advice, avoid IBA. saw Mr Morland's quotes. All good points. 1st half c/flow upon which Mr Cohen has placed emphasis gets pulled back hugely on the back 6 as, presumably, invoices and cash are badly unsynced (check what happened last year). No one else is pretending IBA is a cash machine. In all this there is also the aspect of results produced by a financier-by-métier such as Mr. Cohen. Already in the best of circumstances the b/sheet photo is the proverbial pull the stomach in as you pass the girls. That performance made by an expert in numbers as opposed to one in operations is another factor to bear in mind. Against that an enlarged group with a health(ier) iSoft 2 cycles down the road has a potential cash cow on its hands. The key is managing iSoft's recovery; and it's not a gimme. iSOFT is a damaged brand in the market place and this is probably the only way to salvage anything of its products. Was there any one specific individual who played the role of Nero or indeed were there several people at iSOFT who could put their hand up for that leading role? There is just so much irony in this deal. Market Seasonality: Still Selling in May?